On his radio show Friday, ESPN fella Dan LeBatard, because he's out in Miami and apparently no one in Bristol listens out there, had a few choice words to say about the Woody Paige, "Cold Pizza" sexual harassment case. He called ESPN "filled with sexual harassment" and said "it's actually funny." And we agree: It is! 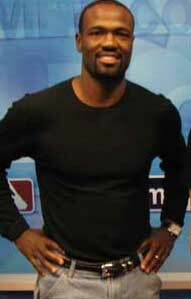 But he saved his loudest admonitions for our pal Harold Reynolds; he says Harold has no business pleading innocence. What's LeBatard's case? Harold hit on his girlfriend. "For Harold to be claiming that he was wrongfully fired.. I don't know how he says that with a straight face." ... "He creeped out two of my girlfriends ... I'm doubtful." You can hear the whole audio at Leave The Man Alone. Personally, we're just creeped out that Dan LeBatard has had multiple girlfriends.